Mandrake the Magician and the Enchantress is a musical from 1973. The musical is based on Lee Falk's comic strip "Mandrake the Magician" in the daily story "The Enchantress" from 1954. The production at "The Amas Six O'Clock Musical Theatre Lab". Mandrake, the greatest magician in the world and his sidekick Lothar, the strongest man in the world (and an African prince of some note) return home from a magic show one night for find Mandrake’s fiancée, Princess Narda, in a state of panic. Books and objects have been flying all over the room. The place is a mess. An old photograph album lies open. Mandrake sees the photograph there revealed and knows instantly that his old girlfriend, Aleena the Enchantress is trying to reach him. She had gone to the College of Magic with him in Tibet. They had made a date to meet in 13 years, which he had forgotten. Meanwhile, at Aleena’s mansion, Malmaison, things are in a run-down state. Her infatuated butler Gurn, a former lover and her Creeps (enchanted beings) do her every bidding. She kidnaps Narda by hypnotizing her long distance and sending Gurn for her, whereupon she is drugged, given a “deadly poison,” and imprisoned deep in the cellar. Only a special antidote given at special times can save her. Mandrake shows up to find Narda, but is enchanted into thinking he is in love with Aleena all over again. She does her best to seduce him. Lothar brings him to with a strong blow to the head. Desperate to find Narda before her life expires, Mandrake communicates with her through magic. Then Mandrake is attacked by horrible creatures and it looks like the end of him. Opens with Mandrake struggling to free himself as Aleena’s creatures go at him. He is saved again by Lothar, but must pretend he is enchanted to save Narda, since Aleena has threatened to kill her if he does not help her rob the U.S. Mint. He calls Narda to him by magic. He then helps Aleena rob the mint but foils her at the end and rescues Narda. Then he disenchants the Creeps. All are revealed to be formerly famous people who vanished: one a champion boxer, one a Nobel Prize-winning physicist, one a famous movie actress. All ends well with Aleena realizing Gurn has been her true love all along. August 1-5 and 8-12, 1973. 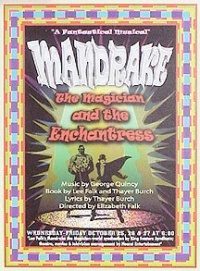 Three performances of the musical, directed by Elizabeth Falk, were set up October 25-27, 1978. In 1974 "Mandrake the Magician and the Enchantress" was optioned by Myron Sanft. He was a producer of industrial shows and had plans to make his legitimate theatre debut with the Mandrake musical. But the sale of the film rights at the time (1975) bollixed acquisition of financial backing for a Broadway run. This page was last edited on 3 June 2017, at 16:37.